"Slap the bag" -- the ancient coming-of-age game involving slapping a bag of wine (usually Franzia) while drinking directly out of its plastic spigot -- is a college staple. As is drinking Fireball. So, it was only a matter of time before the two converged in alcoholic matrimony to create the perfect party vessel: boxed Fireball. Cinnamon whiskey, in a bag. 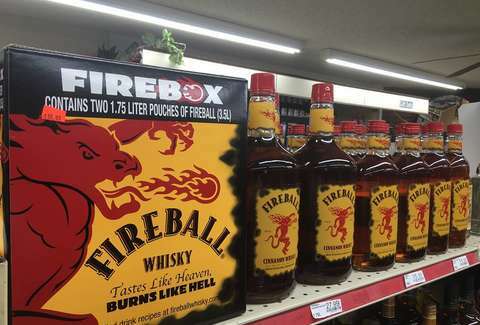 In case you missed it, the aptly named "Firebox" contains 3.5 liters of Fireball in two 1.75-liter pouches -- so in theory, you could have two games of "slap the Fireball" simultaneously running, and why would you not? As you can see, this is perfect for sharing with a close friend. Or at least a stranger you think you'd get along with. The standard US shot size is generally recognized as 1.5oz, these two pouches come together to give drinkers about 55 shots per box. And at an approximate price of $50, you are getting more than a shot per dollar -- which is cheaper than pretty much any liquor ever, except maybe prison hooch. And it's probably better. Trust me, I'm from New Jersey. It's pretty much our main source of hydration.